Hoping to resolve the matter with a blockade of deadly battleships, the greedy Trump Federation has stopped all shipping to the small planet of EU. 20 years after I sat down in a London cinema, saw the above trailer crawl (minus two small edits astute readers might notice), sighed and thought to myself “I watch Star Wars to get away from this kind of thing,” here we have life imitating George Lucas. It’s impossible to ignore we are potentially close to several major conflicts. India is considering military retaliation against Pakistan for a recent terrorist outrage – that’s two nuclear powers; Iran and Israel have both warned the other that war is a real threat – that’s one and a half nuclear powers; the West is upping the rhetorical ante in Venezuela even as President(?) Maduro shows no signs of leaving office; and China is still building a huge modern army, navy, and air-force that I am sure the US is going to see as strictly decorative. (In the same way China promised not to decorate the South China Sea with runways and missiles.) And on top of all that, as the recent Munich Security Conference showed, the US and EU are drifting ever-further apart on most of those fronts – and on the economic angle too. Some might see the US under the Trump administration as the Empire; and some see them as the Rebels against a Russian/Chinese Empire and the risk of an Iranian Death Star. Of course Germany sees itself as Naboo: peace-loving, cultured, innocent, free-trading, and full of renaissance architecture and star würst - and unable to defend itself against physical predations from outside. The complication today is that it may be the Jedi who impose 25% tariffs on Naboo because the latter refuses to join in a greater struggle against others “Made in Empire 2025” plans. I have a bad feeling about this. So the EU strategy is not to join the US, but to wait and do nothing. Is that attitude going to see the US back off vs. the EU? Or will the US see the EU as too weak and too fundamentally untrustworthy to bother with? Yes, the US is still global hegemon and needs the EU, Japan, Australia/NZ, etc., in its camp to remain one; but some think it can raise the drawbridge and go back to splendid isolation, telling the rest of the world to go hang: no more Clone Wars; just the The Revenge of the Sith, as some would see it. 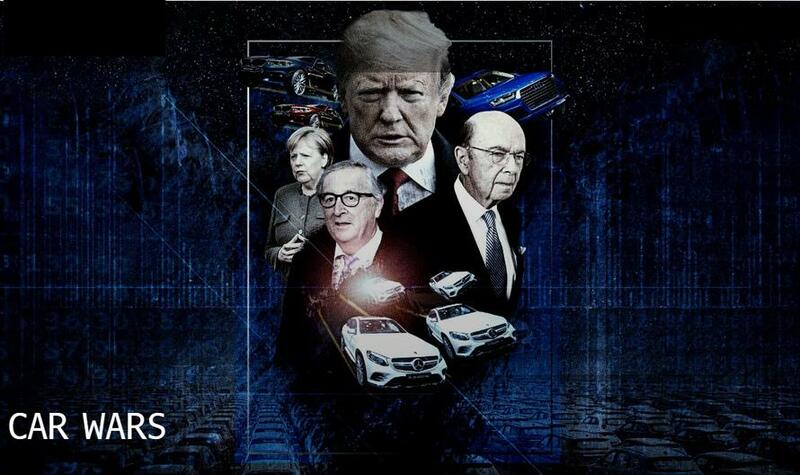 In short, there is a potentially paradigm-shattering geopolitical shift being discussed all over: does anyone have any idea how to trade it…or are we all just waiting for a New Hope? I fail to see how this is anything other than USD and US Treasury positive, for now at least. Longer term, we are all throwing light-sabres at a board. And talking of paradigm-shattering, at the national level we see the same theme repeated, as seven UK Labour MPs split from the party over Brexit and anti-Semitism. Will they forge a new centre grouping, or are they the just showing how impotent the centre actually is in a world increasingly driven to polarities? GBP doesn’t seem to care. In other words, the RBA aren’t talking more strongly about cutting rates yet because they still think wages will pick up into a new-normal housing collapse, and because they believe it shows more confidence to do nothing. I repeat: rates down - sooner than you think; and AUD down with it. Nothing doing today though – I guess the market is glued to Twitter waiting to see if the rumours of Episode IX being called “The Balance of the Force” are true or not. If it is, the 20-year rule George Lucas forecast rule tells me 2039 is when we should expect all this global flux to have sorted itself out. Before 2039 we also have UK unemployment, which will stay low, and the German ZEW survey, which is seen declining sharply to 20.0 for current situation and rising to -13.6 for expectations. I’d suggest the other way round is more logical.